Posted on Wed, Feb 15, 2012 : 2 p.m.
As per usual, I found myself one evening with tidbits of leftover ingredients floating around in my kitchen. Every so often, a girl's gotta have a "clean out the fridge" night! I didn't want to make fajitas with my beef and peppers, and I didn't want to make a Chinese-style dish either. So I meandered over to a different continent for inspiration and cooked up a Greek stir fry instead. This was ridiculously easy to prepare, but the flavors were so vibrant! A little sweet, a little tart, a little salty... it was a perfect mix. The oregano and the olive oil combine beautifully with the vegetables, transforming them from the mundane and familiar into something new. And the lemon juice and feta liven things up a bit, as well. This was good enough that it deserves to be made again, rather than just having been a way to use up leftovers. You could serve this over rice, and it would be lovely. It would be wonderful stuffed into a pita. But if you're eating a low-carb diet, this is fabulous all on its own, too. And for those who don't want the meat, just double the peppers. For a meal that was based upon scraps, this certainly did rise above the sum of its measly little parts! Heat the oil over medium-high heat in a large skillet. Add the onion and peppers; saute for 5 minutes until vegetables are tender.Add beef, lower heat to medium, and saute just until meat is thoroughly browned. Add oregano, salt and lemon juice; cook for 1 minute. Add spinach and cook just until wilted. 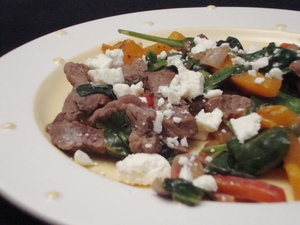 Remove from heat, place onto a serving dish, and sprinkle with Feta. Thu, Feb 16, 2012 : 4:50 p.m. Sounds delicious and easy. I really like the idea of the feta sprinkled on to.